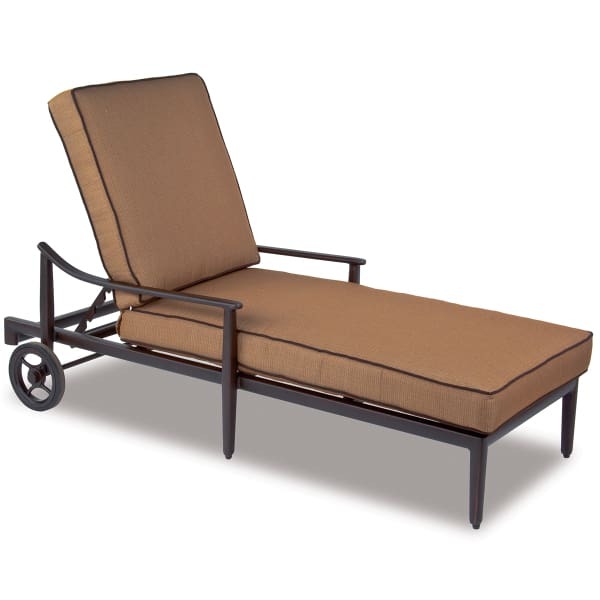 The Sutton Chaise Lounge belongs to a larger collection of Sutton furniture designed and made by Cast Classics. The collection is unique for its thin, durable frames, squared pillows and angular lines. The chaise lounge sits on two wheels for easy transportation and rearrangement. The seatback is adjustable to meet needs that change during the day: upright to eat a morning snack, partly reclined to read a magazine at midday, and fully reclined for stargazing at night. Both the frame and the cushion are completely customizable by you, and Cast Classics has a huge range of options to choose from. The Sutton Chaise Lounge is angular and simple, so would easily integrate into an existing patio setting, or you may choose to add it to a collection of other perfectly matching furniture, like Sutton dining, deep seating or bar height settings. This item requires freight delivery. This shipping method uses a full size semi - truck and product can be delivered to a street side location or into a room of choice based on the level of service requested. A representative will call to schedule your delivery which will require a signature upon receipt. Most delivery times within the Continental U.S. range from 5-7 days on in stock merchandise. Special order patio furniture ranges from 2-6 weeks depending on manufacturer.